To the north of Cambridge a new housing estate is being built. Well, it was being built, though things seem to have slowed down a bit recently, presumably because the property market is in the doldrums. I’ve seen some of the houses, and actually been inside one, and they’re not bad, as modern buildings go. But I have to wonder at the intelligence of the developers. At first, they named the estate ‘Arbury Park’ – a delightful-sounding name unless you happen to ask a local, in which case you’d discover that Arbury, the estate next door, is, shall we say, not deemed to be amongst the more desirable areas of the city. After building a large number of houses, I presume that they cottoned on to this because some months ago it was renamed ‘Orchard Park’, a ‘mixed use development including 700 prestige homes’. And they’ve managed to convey just some of this prestige in the proud sign that announces the project to passers-by. I assumed this was a temporary sign. Very many months ago. The site will provide 900 quality homes – 270 of which will be ‘affordable’. Update: Have a look at the comments for some interesting background to the story… and in the afternoon of the day I posted this, I drove past the sign again, to find that it had finally, after many months, been replaced a couple of days before. Which makes it look much more professional, but now, knowing the story, I can’t help but feeling the old one was rather more fun! As far as I can recall, there was a decision to rename the estate, but the developers and/or council didn’t bother replacing the signs. This was OK, as the residents luckily already had sign-making expertise, as no one had put streetname signs up and they had had to make their own. They therefore have beautiful, artistic street signs which were produced locally. And so eventually, the residents also stuck their own signs over the developers’s site signs, like the one you show here. Legally, the site was actually called Arbury Camps…it was the developers that “branded” it Arbury Park. The school was then named “Orchard Park”…to help minimise the confusion, the residents were polled on a name change and “Orchard Park” was the preferred result. The area officially became Orchard Park in April 2009 after it was legally separated from Impington and became a government parish in its own right. The County Council were slow to replace the official road signs, but this has been chased through and is now done. 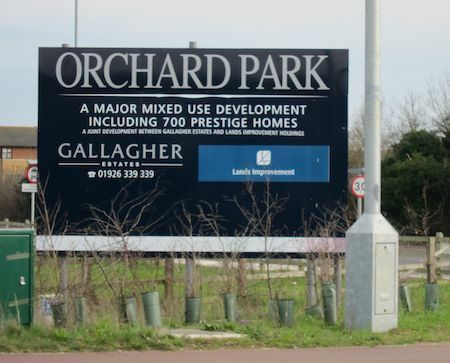 Gallagher Estates commented that they saw no need to change the signs, but a guerilla campaign last autumn saw their signs re-labelled, and only a few days ago, Gallagher formally replaced the sign above with one for Orchard Park. The new name reflects the history of the area which used to be part of the orchards for the Chivers jam business…Arbury Camps vaguely reflects the history that there used to be a Roman camp here called something like Hardburgh which over the centuries has mutated to Arbury. Calling the development Arbury Park and the school Orchard Park was just bizarre and would have led to huge confusion!! The “DIY” street signs were created as part of the public arts project and were designed and installed by residents back in the first summer of occupation in 2007 when it became clear that we might have to wait several years for the different parties involved to install proper street signs…in the meantime, visitors, taxis, Tesco vans etc etc were getting lost every day. As best as possible, the DIY signs are being saved and will form part of an arts display on the site.